Weeds. They’re the pesky, wild plants that grow rampant and wreak havoc on our yards and gardens. When we see them, we often think we need to repel them. But what if there was a weed that could help us fight serious health conditions? There is, in fact, such a weed — kudzu. The plant is native to China and Japan and is characterized by its lush, trailing vines and purple-blue flowers. It also has a thick root that resembles a potato. Though beautiful, the plant has a reputation for being a menacing weed. It grows at rapid rates, climbing up walls and covering trees, telephone poles and houses. But if you’re not a gardener, the kudzu plant is actually one of the good guys. It could help curb alcoholism and may even fight inflammatory diseases. What exactly are the benefits of kudzu? Are kudzu root extract and kudzu powder safe to consume? And how can this wonder weed help you? Sleep, caffeine and greasy food may be the go-to hangover remedies in North America, but in China and Southeast Asia, kudzu is the preferred method to treat hangovers. A bit of kudzu likely won’t hurt after the occasional night of drinking, although research has yet to conclusively prove that the herb is a true, or safe, hangover cure (x). But kudzu has not always been known as a hangover remedy–it’s also a traditional treatment for alcoholism. Recent research suggests that kudzu root extract may, in fact, be able to relieve alcohol cravings. In a study published by Psychopharmacology, researchers gave kudzu extract to heavy drinkers who were diagnosed with either alcohol abuse or dependency. Those who took the extract drank 34-57 percent less alcohol each week than those who did not (x). These heavy drinkers (who weren’t seeking treatment) also spent fewer days binge drinking and actually abstained from drinking alcohol for longer periods of time while supplementing with kudzu (x). Another study suggests that kudzu extract can reduce intake during binge drinking. Those who used kudzu in one study drank fewer beers at slower rates than those who did not (x). Kudzu may not be able to curb cravings, nor does it reduce the intoxicating effects of alcohol (x). But it can help people drink less frequently. But how exactly does kudzu have these effects on drinkers? Research is ongoing, but scientists believe that an antioxidant found in the plant known as puerarin, may have something to do with it (x). Puerarin is an isoflavone naturally found in kudzu and other plants. Studies suggest that it increases blood flow to the brain. In one study, subjects who took puerarin drank less alcohol than those in the placebo group. They took smaller sips and spent more time finishing their beer, and noted prolonged delays between finishing a beer and opening a new one (x). The BBC conducted a similar study using kudzu root extract instead of pure puerarin. Those who took kudzu beforehand drank 20 percent less than those who didn’t (x). Research on the correlation between kudzu and alcohol consumption is still ongoing. From what we do know, it appears that kudzu can treat binge drinking and alcoholism–and there aren’t many other herbal and pharmaceutical medicines that can say the same. Kudzu has traditionally served as a remedy for diarrhea for over 2,000 years. The Chinese also use it to treat high blood pressure, migraines and inflammation. And recent research now suggests that there may be some validity behind all this. Scientists have identified over 70 phytonutrients in kudzu root, and a high concentration of flavonoids, in particular (x). All fruits and plants contain a plethora of different phytonutrients. Flavonoids are the most common. They have powerful antioxidant and anti-inflammatory properties that support your immune system and treat diseases caused by inflammation and oxidation. These include cancer, diabetes, irritable bowel syndrome and cardiovascular disease (x) (x). Puerarin, which is naturally found in kudzu, can also reduce inflammation and may even be able to fight against cardiovascular disease (x). Another molecule found naturally in kudzu is isoorientin, which also has anti-inflammatory properties (x). When you come down with an upset stomach, what do you do? You may sip on some minty tea or nibble on a couple of saltine crackers. You may even grab a few antacids if you develop heartburn and indigestion. Try adding kudzu to your list of natural treatments for an upset stomach. According to the PMC, kudzu is an effective remedy for stomach issues, relieving indigestion, constipation and even gastritis. (x). When broken down, kudzu root has a thick and sticky consistency resembling a type of mucus that naturally coats the lining of the stomach. This mucus helps break down acid found in the stomach. Because of its similarity to stomach mucus, kudzu can help counteract acid buildup in the stomach. It’s common to come down with nausea or cramping after eating certain foods or contracting a virus. Even the occasional case of indigestion is common. But what if your stomach ache progresses to diarrhea, painful bloating and nausea? Gastritis is a condition that occurs when the lining of the stomach becomes inflamed. Stress, medications, heavy alcohol use and bacterial or viral infections can cause it. While doctors usually prescribe antibiotics and over-the counter medications to treat gastritis, anti-inflammatory supplements can also help relieve stomach inflammation. Because kudzu is rich in flavonoids, it may be able to reduce inflammation in the stomach. Flavonoids also help to activate the body’s immune responses to more effectively eradicate infections like the stomach flu (x). The kudzu plant is also rich in fiber. Increasing one’s fiber intake can ease constipation and promote regular bowel movements. During menopause, a woman’s ovaries stop releasing eggs. The ovaries also stop releasing progesterone and estrogen hormones, both of which are responsible for menstruation and ovulation. While it’s a natural physiological process, menopause causes a host of adverse side effects. Mood swings, fatigue and hot flashes are the most common. It’s not exactly known why women experience hot flashes during menopause, but it’s widely believed that the decrease in estrogen production is to blame. Many menopausal women have undergone hormone replacement therapy to combat their symptoms. Taking estrogen pills has been the traditional route, but research indicates that the kudzu plant may be able to offer a more natural means of estrogen replacement therapy. Kudzu contains phytoestrogens, which are plant-derived chemicals with estrogenic effects. There are two types of phytoestrogens: lignans and isoflavones. Kudzu contains isoflavones, specifically daidzein. When metabolized, daidzein mimics estrogen molecules in the body (x). Weight gain is common during and after menopause, increasing a woman’s risk of developing diabetes and cardiovascular disease. Not only can daidzein alleviate menopausal symptoms by mimicking the effects of estrogen, it’s also known to reduce food intake and help with weight loss (x). Additionally, it has anti-inflammatory and antioxidant effects on vascular activity (x). Kudzu belongs to a group of plants known as Pueraria. Kudzu is also called Japanese Arrowroot. Today, the kudzu vine grows across Southeast Asia, in the Pacific Islands and in North America. Grazing animals feed on kudzu. People make baskets, clothing and paper out of kudzu fibers. Kuzumachi is a Japanese dessert made from kudzu root and kudzu flower. In East Asia, kudzu teas, tinctures and even kudzu jelly are readily available. Kudzu was first brought to the United States from Japan in the late 19th century at the 1876 World’s Fair. Those in attendance took a liking to the plant for its beauty and long vines. Many people began to grow it in their backyards for ornamental display. The vines can take years to develop. Trying to harvest kudzu root at one point in time seemed unrealistic to American farmers, but after the Dust Bowl ravaged North America in the 1930s, farmers began to plant kudzu vine to combat soil erosion. (x). Dosages for kudzu supplements varies widely. It’s important to always consult with a physician or healthcare professional before taking any supplements, natural or not. As a dietary supplement, take 1200 mg (heavy 1/3 tsp) once or twice daily, or as directed by a physician. It’s best to take kudzu with meals. (x). If you use kudzu to treat alcoholism, prior to a drinking, take 1.5-3 grams of kudzu root extract three times daily. Follow this regimen for 1-4 weeks. Kudzu is hepatotoxic, meaning excessive amounts could harm your liver, so it’s important to stick to the recommended daily dosage (x). People with liver disease or damage shouldn’t take kudzu. If you’ve recently had surgery, you also shouldn’t take kudzu. When taking kudzu, you may experience side effects such as itchiness/skin irritation, dizziness or upset stomach. Talk to your doctor before taking kudzu, or if you’re taking any medications that may interact with it. Who would’ve thought a weed could have so many health benefits? When taken in small doses, kudzu can treat alcoholism and inflammation. It can also treat stomach ailments and the symptoms of menopause. 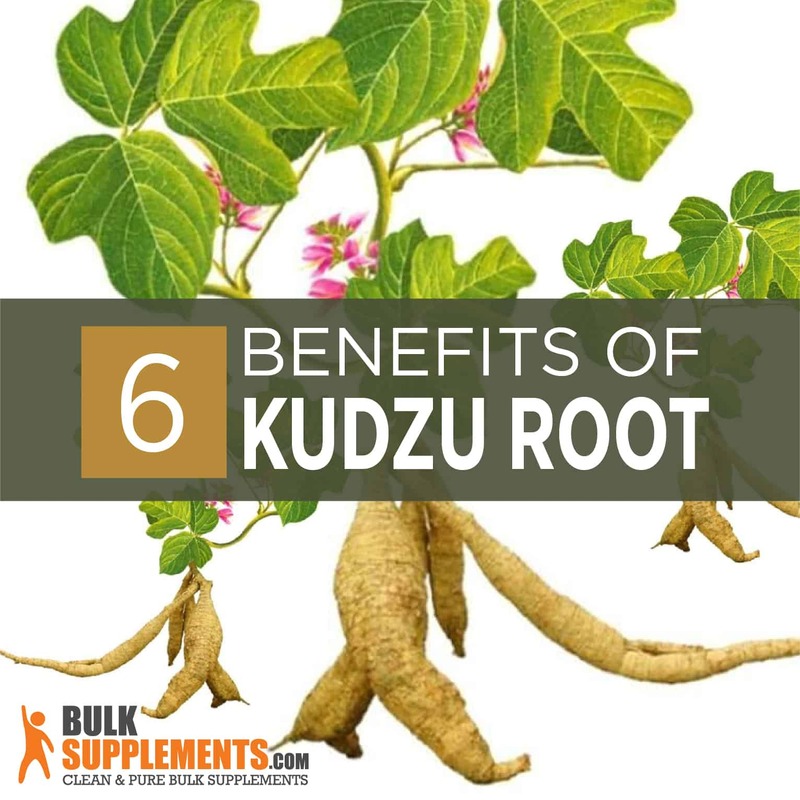 If you think you could benefit from taking kudzu root extract, talk to your doctor to see if this weed is right for you.